View More In Edible Ink Printers. 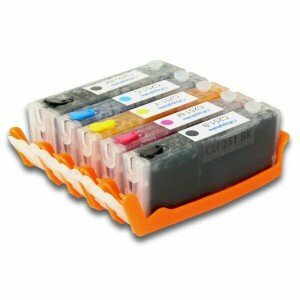 Place this set of edible ink cartridges into a compatible printer and print any image onto an edible frosting sheet. The edible ink offers outstanding colour reproduction without clogging the print head. Compatible with the following (North American) models of Canon printers: IP7220, IP8720*, IX6820, MG5420, MG5422, MG5520, MG5522, MG5620, MG6320*, MG6420, MG6620, MG7120*, MG7520*, MX722, and MX922. If you have any questions about this product by Kopykake - Canon, contact us by completing and submitting the form below. If you are looking for a specif part number, please include it with your message.